A colored grout pen provides an option to having to redo an entire grout job in a home: Grout pens work their magic by painting over and staining dated, funky, ugly grout. You don't have to deal with harsh chemicals; grout pens are water-based and non-flammable. The fresh, new look achieved with a grout pen lasts a long time because it is impervious to water. Grout pens enhance the color of grout, like this porcelain tile with earth-tone grout. Several companies provide grout pens specifically suited to cleaning and restoring white grout only. White grout pens are the most predominant type because white grout is the most notorious grout color for staining. White grout issues with kitchen countertops and shower/tub surrounds are common. A white grout pen spruces up these areas in a home. Companies specializing in tile and stone products provide several earth-tone-based grout pens. An earth-tone grout pen is well suited for beige-toned natural stone tile such as travertine. 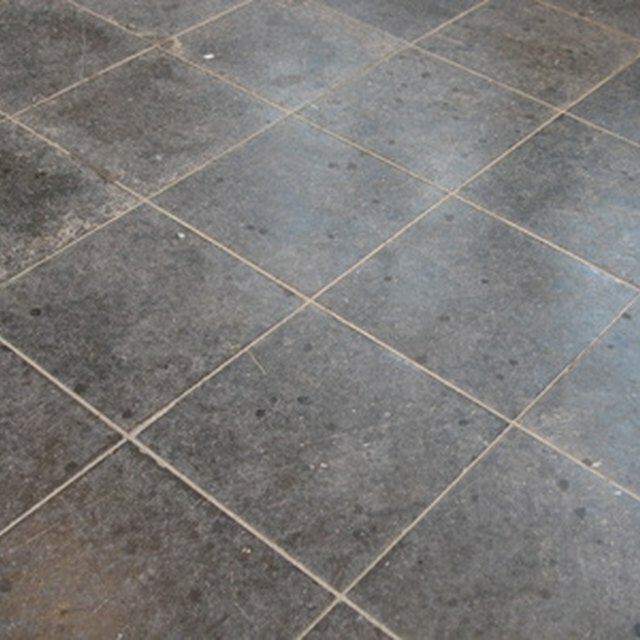 Gray grout is highly durable and resistant to showing stains. That's why porcelain flooring and home bathrooms frequently feature gray grout. Nevertheless, time and use stain gray grout; a gray-colored grout pen cleans and brightens it. Manufacturers recommend cleaning grout prior to using a grout pen and allowing grout to thoroughly dry before applying the pen. The grout surface must be free of wear-and-tear grime; grout pen manufacturers instruct users to not use a grout pen to cover up stains, mildew and other surface contaminants. Sealer repels grout pens; sealing before application prevents the use of a grout pen. Manufacturers also recommend applying the grout pen to a test area before attempting to color in the entire area. How Can I Remove Yellow Stains From a Marble-Top Table? Can You Cover an Old Wood Deck With Porcelain Tile?